As soon as kids unleash Zing’s new Air Storm line, they’ll have foam ammo flying in more ways than they can imagine! Hit top heights with Pop Rocketz or nail the bull’s-eye with the Z-X Crossbow. 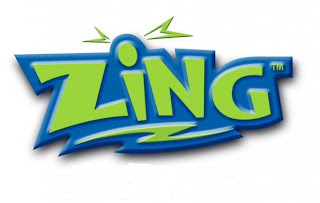 These Zing products pack a major punch in a stealth size. Take your pick--the Air Storm arsenal is loads of fun with several ways to play. The Z-X CrossBow will stick it to ya’. The Power Swing technology enables the bow arms to pop open for action and send super-soft suction cup Zartz flying. Lock ‘n’ load the soft foam ammo for anytime-action. Pull the trigger to hit and stick targets from over 45 feet! Built-in ammo clips keep extra Zartz ready to fire at a moment’s notice. Prepare for take-off with the Air Storm Pop Rocketz! This pocket-sized, take-anywhere, air-powered rocket launcher blasts foam rockets that soar more than 50 feet! Real rocket launch action that’s safe for indoors and out. Easy enough for a toddler to use, cool enough for a teen! Designed for ages 5 and up but my 4 year old had no troubles at all with it. Made of soft foam so you can play with it outside or indoors. 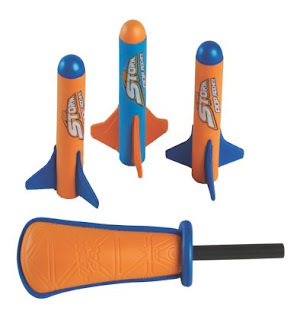 It comes with 3 small rockets to use. The black stick where you attach the rocket wasn’t glued in well and came out after only 5 shots. It isn’t hard to reattach the base stick and you can still use it. If you don’t reglue it, the black stick will stay inside of the foam rocket while it travels. If yours falls apart have some super glue on hand to reattach it. What is great about these toys is that you can use them indoors and out! I know my kids can not always easily play outside, either it is just too hot, or cold in the winter. This gets them some action without my fear of breaking everything in site!